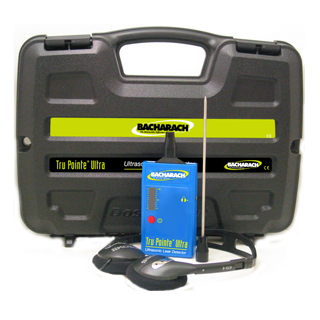 Bacharach’s Tru Pointe® Ultra is a compact ultrasonic leak detector that uses patented technology to detect leaks in air conditioning and refrigeration systems. The Tru Pointe Ultra is the world’s first pocket-size electronic instrument that can simultaneously detect the vacuum and high pressure leaks that occur in HVAC/R systems. The Tru Pointe Ultra guides the user to a leak by quantifying the intensity of the ultrasound and converting it to a sound the user can hear easily through headphones. No warm up needed - detects instantly. Instant off with release of the button saves battery life. Holds all items for safe storage and makes it very easy to locate on a job site. 430 TruReward$ points will be placed in your account when you buy this item.